This guide covers Waiheke Island only. 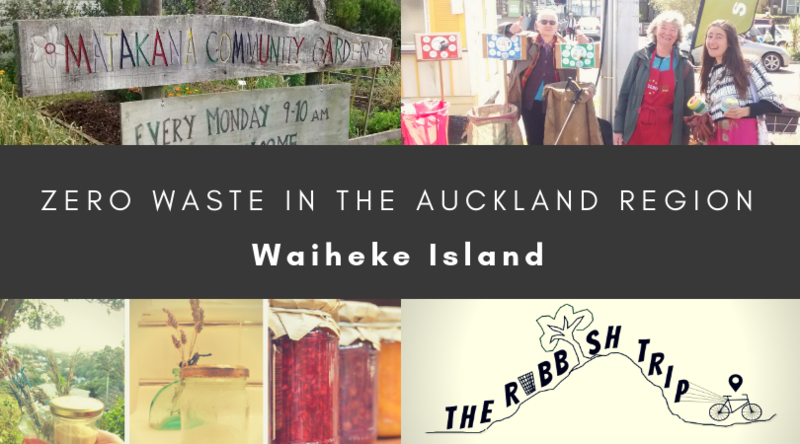 For other areas of Auckland, please refer to the Zero Waste in the Auckland Region post. NB: All our regional guides cover as many low-waste options as we could find for food, drink, kitchen and food packaging, cleaning products and bathroom products – scroll down to view each category. On the landing page for the region (above), we also list community groups, council services and ideas for tricky waste streams, so make sure you read that part too! Plastic Free Pantry – Waiheke is incredibly lucky to have Plastic Free Pantry, one of only two truly zero waste grocery delivery services in NZ. You can order a wide range of dried bulk foods and pantry staples (including organic) such as grains, nuts, seeds, dried fruit, flours, spices, muesli, sweets and snacks, recipe kits and more. All you do is order online and they deliver to you the next day in glass jars. You then put your empty jars out for them on the next delivery day and they’ll take them back for sterilisation and refill, so they just go around and around the system (just like the old-school milk run)! There are a few delivery services out there that package their deliveries in brown paper bags, but as these bags are still single-use, it is an inefficient overuse of resources. So Plastic-Free Pantry’s glass jar refill and return system is far more zero waste. For more details, read about how it works on the Plastic Free Pantry website. The Island Grocer, 110 Oceanview Road, Oneroa – has a range of bulk bins with organic ingredients, including grains, legumes, flours, seeds and nutritional yeast (on the pricey end of the spectrum). Also stocks vanilla essence and paste in glass jars/bottles (rather than plastic). Most of the fruit and vegetables in the store are unpackaged, just remember to BYO bags to put them in. Gulf Foods, 19 Tahi Road, Ostend – stocks a great range of bulk bins with a mixture of both organic and non-organic items at affordable prices, including grains, flours, legumes, nuts, seeds, dried fruit, sugars, spices and condiments. Also has liquid foods on tap, such as oils, vinegars, and tamari. Green Space, 20 Tahi Road, Ostend – while most of the bulk food here is packaged in cellophane (and some returnable/refillable glass jars thanks to Plastic Free Pantry), there are a few products available in bulk: fresh organic dates, and maple syrup and apple cider vinegar on tap which you can fill into your own bottles. Supermarkets – Waiheke’s supermarket does have a bulk bin/pick and mix section with wholefoods (BYO bags for these). However, the items in the bulk bins are pretty pricey, often more so than equivalent ingredients in packets (bah! ), and pricier than the bulk bins at Gulf Foods (even the organic products in bulk bins at Gulf Foods!). But look out for when things in the bulk bin aisle in supermarkets are on special because sometimes you can get a good deal! Places that sell unpackaged meat, sausages, smallgoods and seafood, who will happily put your unwrapped purchases straight into a BYO container – woohoo! Village Butchery, 102 Oceanview Road, Oneroa – this shop is more than happy to put your cuts of meat into a BYO container. Te Matuku Oysters, 17 Belgium Street, Ostend – fresh fish and shellfish available unpackaged into your own containers. Try your luck with BYO containers at the supermarket delis – Most supermarkets have a deli section offering meat, seafood, olives and other antipasti, salads, lunch foods and more – all unpackaged. Some supermarkets will allow you to BYO container for these goods, while others won’t. It can be hit and miss, often depending on the staff member you talk to. For example, New World and PAK’nSAVE supermarkets have a flexible franchise model which means they can usually make their own in store decisions about whether to allow BYO containers or not, whereas pretty much any Countdown will not accept BYO containers. It’s always worth asking though! Markets, co-ops and crop swap – check out the Waiheke Ostend Market, Belgium Street, Ostend, every Saturday, for excellent produce – BYO bags to put fresh fruit and veges in. Here you can also get cheese straight off the round into your own container at the Helios stall (try the amazing bread too!). You may also be interested in the monthly crop swap running at the Waiheke Sustainability Centre, Mako Street, Oneroa – this is a money-less exchange, just bring some of your homegrown produce or homemade baking and preserves to share and exchange for the produce, baking and preserves of others in the community. Waiheke also has various co-ops from which you can benefit from bulk buying power – again, just make sure your share is divvied up into reusable bags and containers. Trade Aid’s entire chocolate range comes in Econic home compostable packaging! You can get it at The Island Grocer, 110 Oceanview Road, Oneroa; and at Green Space, 20 Tahi Road, Ostend. Trade Aid sugar also comes in 100% brown paper, and the coconut oil in glass jars with no plastic seal around the rim – both are available at The Island Grocer. Coffee – Waiheke Island has two local roasters who can sort you for unpackaged coffee – yay! Island Coffee, 21 Belgium Street, Ostend is more than happy to put their freshly roasted unpackaged beans or grinds straight into your BYO bag/container – just ask at the counter. FYI that the roastery is only open in the mornings! Alternatively, Roast Waiheke sells their yummy freshly roasted beans and grinds inside at the Waiheke Ostend Market. It’s all prepackaged, but if you ask nicely then you can get a prepacked bag of coffee poured into your own bag or container, the owners are then happy to repack that bag rather than chucking it out. Roast Waiheke also does home deliveries of coffee and might be open to delivering in your own containers if you ask nicely and can work out a system with them that works (you could have a glass jar exchange where you use two glass jars. You put one empty one in your letterbox, and they swap it for your other full one and take the empty away to refill for next time). Drinking chocolate – find Kokako‘s drinking chocolate, which comes in home compostable packaging, at The Island Grocer, 110 Oceanview Road, Oneroa; and RAW at Waiheke, 4 Putiki Road, Ostend. You can get cocoa powder in from the bulk bins at Gulf Foods, 19 Tahi Road, Ostend. Tea – we avoid teabags as many brands use plastic in them, so we go for loose leaf instead. BYO jar to Timmy Smith, 143 Oceanview Road, Oneroa, and they’ll be able to weigh out 25g portions of what they already have open into your jar. You can also get loose leaf tea in returnable/refillable glass jars at Green Space, 20 Tahi Road, Ostend; or order a range of loose leaf teas through Plastic Free Pantry. Beer – the key to zero waste beer is to bring your own flagons/bottles to stores that sell beer on tap. You’ve got options on Waiheke! You could go for one of the oldest craft beers in New Zealand, by master brewer Alan Knight, at Waiheke Island Brewery, located at Wild on Waiheke, 82 Onetangi Road, Onetangi. Alternatively, check out Boogie Van Brewing, 29B Tahi Road or Alibi Brewing Company, 70/72 Onetangi Road. Say “no more” to disposable takeaway coffee cups and plastic water bottles by getting yourself reusables instead! Get reusable water bottles at Veranda, 2/116 Oceanview Road, Oneroa; Island Design, 114 Oceanview Road, Oneroa; Eclectic Boutique, 28 Belgium Street, Ostend; True Blue, 21 Belgium Street, Ostend; and The Living Room, 26 Tahi Road, Ostend. Find the Keep Cup brand at The Island Grocer, 110 Oceanview Road, Oneroa; Veranda, 2/116 Oceanview Road, Oneroa; Likerish, 23D Belgium St, Ostend; Island Coffee, 21B Belgium Street, Ostend; or order one with your next delivery with Plastic Free Pantry. You can also get the NZ-made Cuppa Coffee Cup and European made Zuperzozial bamboo/corn based cups at True Blue, 21 Belgium Street, Ostend. Reusable lunch boxes or containers are great to have on you when you’re out and about in case you want to get takeaways, to carry leftovers home with you, or if you find food to forage. You can get Meals in Steel stainless steel lunchboxes and food containers at The Living Room, 26 Tahi Road, Ostend. Plastic shopping bags are a menace, but so too are those plastic produce bags for fruit and vege or the plastic bags often offered alongside bulk bins at bulk stores. You can avoid them by bringing your own bags or buying a set of reusable produce bags. You can get 100% cotton produce, bulk bin and/or shopping bags at The Island Grocer, 110 Oceanview Road, Oneroa; Veranda, 2/116 Oceanview Road, Oneroa; and Green Space, 20 Tahi Road, Ostend. For reusable shopping bags, look no further than the BYO Bag Waiheke bags available at Upcycle Re-Design Store in Pendragon Mall, Oneroa. Say “no straw thanks” next time you order a drink out and either use your mouth to drink, or get yourself a reusable metal straw instead. If you’re keen on a reusable metal straw, you can get them from The Island Grocer, 110 Oceanview Road, Oneroa; Eclectic Boutique, 28 Belgium Street, Ostend; metal AND glass straws from Oneroa Pharmacy, 120 Oceanview Road, Oneroa; or order metal straws with your next delivery with Plastic Free Pantry. Purchase at Veranda, 2/116 Oceanview Road, Oneroa; Green Space, 20 Tahi Road, Ostend. DIY (waaaay cheaper): You just need to get natural fibre fabric (cotton) and unpackaged beeswax. Keep an eye out at secondhand stores and fabric stores for off-cuts of cotton. Get unpackaged beeswax candles at Green Space, 20 Tahi Road, Ostend. Silicone covers for pots/bowls (an alternative to plastic cling wrap and tin foil) are available at True Blue, 21 Belgium Street, Ostend. You can find dishbrushes with wooden handles and removable + replaceable, home compostable heads at Waiheke Sustainability Centre, Mako St, Oneroa; Veranda, 2/116 Oceanview Road, Oneroa; Te Matuku Oysters, 17 Belgium Street, Ostend; Eclectic Boutique, 28 Belgium Street, Ostend; and Green Space, 20 Tahi Road, Ostend. You can also get wooden/plant fibre (thus home compostable) veggie brushes which also work well as dish scrubbers from Te Matuku Oysters, 17 Belgium Street, Ostend; and Green Space, 20 Tahi Road, Ostend. For something more like a traditional dishcloth sponge, check out the Wet-it! 100% cotton + cellulose dishcloth sponges (home compostable at the end of their life) which are available at Te Matuku Oysters, 17 Belgium Street, Ostend. Another brand of the same type of cloth is SPRUCE, which you can order with your next delivery with Plastic Free Pantry. You can get 100% cotton dishcloths at Veranda, 2/116 Oceanview Road, Oneroa. Waiheke Sustainability Centre, Mako St, Oneroa – stocks a huge range of bulk Ecostore cleaning products, simply BYO bottle to refill – including laundry liquid and dishing liquid, multipurpose cleaner, glass cleaner, floor cleaner, toilet cleaner… the list goes on. Gulf Foods, 19 Tahi Road, Ostend – stocks a great range of bulk Earthwise cleaning products, simply BYO bottle to refill. Gulf Foods also stocks refills of powdered cleaning products (like laundry powder). Green Space, 20 Tahi Road, Ostend – stocks a small refill range of Ecostore cleaning products. Soapnuts – natural nut shells that release saponin (like soap) in water and can be used for laundry. Once spent, the shells can be composted. The SoapNuts NZ brand comes only in a cardboard box with no inner plastic lining. You can order with your next delivery with Plastic Free Pantry. Non-plastic clothes pegs – Go Bamboo pegs are available at The Island Grocer, 110 Oceanview Road, Oneroa; Green Space, 20 Tahi Road, Ostend; RAW at Waiheke, 4 Putiki Road, Ostend or through Plastic Free Pantry. You can also get metal pegs at Green Space, 20 Tahi Road, Ostend. Baking soda/vinegar – available unpackaged in bulk bins/refills at Gulf Foods, 19 Tahi Road, Ostend. Or you can get baking soda through Plastic Free Pantry. Bamboo toothbrushes – a great alternative to plastic toothbrushes because they have wooden, home compostable handles (though bristles are still plastic and need to be removed from the handle and put in a rubbish bin). You can find bamboo toothbrushes at The Island Grocer, 110 Oceanview Road, Oneroa; Oneroa Unichem Pharmacy, 120 Oceanview Road, Oneroa; Green Space, 20 Tahi Road, Ostend; RAW at Waiheke, 4 Putiki Road, Ostend or order one with your next delivery with Plastic Free Pantry. Dental Floss – Countdown stocks Do Gooder floss, which comes in a refillable glass tube with a screw on metal lid. The WHITE floss is made of 100% silk and is home compostable (the black, bamboo and activated charcoal floss has polyester in it so is landfill only). When you run out of the floss, no need to get a new dispenser, you can get refills of the floss in a cardboard box from www.dogooder.co.nz – just pop the refill into your original metal/glass dispenser. Alternatively, Green Space, 20 Tahi Road, Ostend, and The Island Grocer, 110 Oceanview Road, Oneroa, stock The Eco Floss in a glass dispenser. The floss is PLA, which is compostable. Sometimes PLA can’t be hard to break down in a home compost but in floss form it is probably OK. This is a good alternative for vegans who may not want to use silk floss. Waiheke Island Botanicals at the Waiheke Ostend Market. Or order one with your next delivery with Plastic Free Pantry. At Upcycle Re-Design Store, Pendragon Mall, Oneroa you can get locally-made bars of soap wrapped in weaved grass/flax. Also, look out for Waiheke Soap Company soap, which is all over the island and is virtually naked (just a wee bit of home compostable wrapping on it). Look out for the popular Ethique range which includes shampoo bars, conditioner bars, shaving bars, deodorant bars, moisturiser bars, etc. (all of Ethique‘s bars come in home compostable packaging). The range is stocked at Oneroa Unichem Pharmacy, 120 Oceanview Road. For a locally-made, very popular shampoo bar, check out Waiheke Island Botanicals at the Waiheke Ostend Market. Alternatively, you can get a local shampoo by Angelica at Green Space, 20 Tahi Road, Ostend. Dirty Hippie bars are also available on the island. Get their shampoo bars and shaving bars from Green Space, 20 Tahi Road, Ostend or their shampoo bars through Plastic Free Pantry. If you’re looking for some sustainably packaged deodorant, Plastic Free Pantry stocks Raw Nature deodorant and insect repellent, both of which come in cardboard (home compostable) tubes. Also get Dirty Hippie deodorant in a cardboard tube at Green Space, 20 Tahi Road, Ostend. Menstrual cups are available at Oneroa Unichem Pharmacy, 120 Oceanview Road, Oneroa; The Island Grocer, 110 Oceanview Road, Oneroa; or Countdown. Avoid plastic shavers that are designed to be disposable and go for 100% metal razors that will last you decades and only require the 100% metal and recyclable blades to be replaced (or sharpened with a leather strop! ), and remember to use a bar of shaving soap instead of shaving foam that comes in an aerosol can (see above) – note, you’ll need a shaving brush to make this work. You can buy razors at Escapade, 114 Oceanview Road, Oneroa or through Plastic Free Pantry. Cotton Buds – Go Bamboo makes home compostable buds so you can avoid the single-use, unrecyclable plastic ones. Get them from Oneroa Pharmacy, 120 Oceanview Road, Oneroa; The Island Grocer, 110 Oceanview Road, Oneroa; RAW at Waiheke, 4 Putiki Road, Ostend; Green Space, 20 Tahi Road, Ostend; or order some with your next delivery with Plastic Free Pantry. Toilet Paper – both Smartass and Greencane toilet paper come wrapped in home compostable packaging. Greencane is available at The Island Grocer, 110 Oceanview Road, Oneroa; and RAW at Waiheke, 4 Putiki Road, Ostend. Get refills into BYO bottles of a range of toiletries (hand wash, shampoo, conditioner) at Waiheke Sustainability Centre, Mako St, Oneroa or Gulf Foods, 19 Tahi Road, Ostend. Angelica Skincare makes a range of lovely skin care products in jars which can be refilled if brought back. You can find Angelica at the Waiheke Ostend Market on Saturdays.